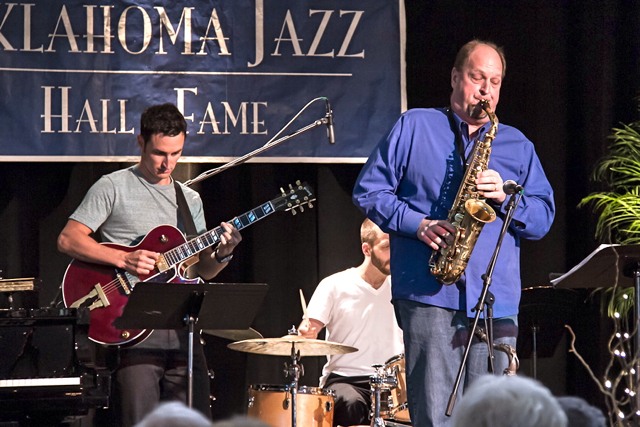 Brian Gorrell & Jazz Company was formed in 1995 when Gorrell moved to Oklahoma City after performing with The Lawrence Welk Orchestra. The group performs a wide variety of styles including traditional & mainstream jazz, fusion, & latin styles. The band focuses on original compositions and also material by diverse composers such as Billy Strayhorn, Michael Brecker, Victor Young, Marcus Miller, Pat Metheny, and many others. which also featured Eric Leonard on trombone in 1995.
featuring contemporary jazz was released in 1999. The Jazz Company always delivers an entertaining first rate show! at the Jazz in June Festival in Norman, Oklahoma. We also regularly feature other talented musicians!